Fifty years later, this book offers a fresh analysis and thorough reevaluation of Venturi’s landmark work and its legacy. Through a radical rereading of material from the archives of Venturi, Scott Brown, and Associates, the editors propose a credible alternative to contemporary architectural discourse, one that takes account of Venturi’s arguments and offers a way forward. 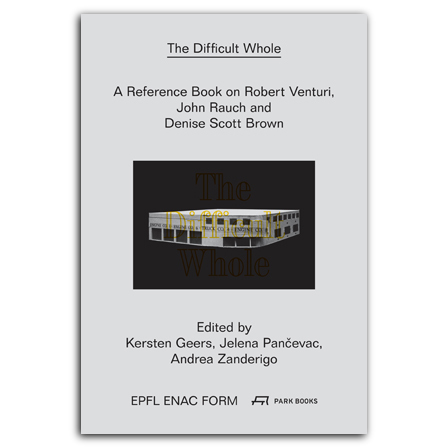 Featuring essays, as well as close analyses of twenty-eight projects by Venturi, Rauch and Scott Brown, The Difficult Whole is sure to spark discussion—and inspiration—throughout the worlds of architecture and design. , born 1975, is a founding partner of architectural firm Office Kersten Geers David Van Severen in Brussels. He is also an Associate Professor at Ecole Polytechnique Fédérale de Lausanne, where he is head of the Laboratory for Architecture as Form. , born 1984, is an architect graduated from the Faculty of Architecture at University of Belgrade. She has been working as a researcher and teaching assistant at EPFL’s Laboratory for Architecture as Form since 2013.
, born 1974, is an architect and a founding partner of architectural firm Baukuh based in Milano. He has been teaching at various universities and is currently teaching at EPFL’s Laboratory for Architecture as Form.